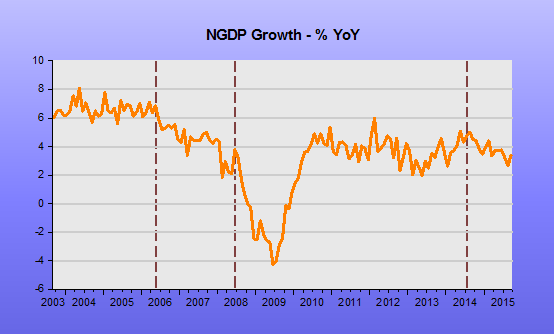 Is Growth Moderate or mediocre? No wonder the Federal Reserve has challenges with its communication these days. They say they are data-dependent but when the data comes in they still can’t agree on what it represents. Data point: 2Q 2016 RGDP growth of 1.2% QoQ annualised and 1.2% YoY, coincidentally. Of course, we favour the latter explanation, and it is moderately encouraging to see Fischer or someone important reading his speech has inserted the caveat. The bulk of Fischer’s speech is very traditional central-banker speak passing the buck for their poor nominal growth management to politicians. So they call on politicians to engage in greater fiscal activism and structural reform to counter the RGDP slowdown, just like we often hear in Europe or Japan. The unspoken assumption is that if the politicians do engage in fiscal activism such that it (inevitably) raises inflation expectations the central bankers will offset it. Central bankers who cannot escape from Inflation Target ceilings, and politicians who don’t assist them are doomed to be trapped by them. Inflation will never reach the targets and nominal growth will be squeezed no matter how low interest rates go or how big is the QE. This fatal mistake is repeated by many outside central banks in mainstream macro. 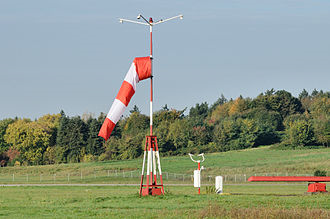 The call to use Helicopter Money is another variant. HM will not be used while Inflation Target ceilings are in place. It seems so obvious that if you move the Inflation Target to a higher plane, to a Level Target or an NGDP LT, then interest rates will naturally move higher as the expectations channel that drives down inflation works in the opposite direction, rendering QE or HM unnecessary. Inflation Target ceilings will cause growth to remain moderate to mediocre for some time unless the Fed can figure out some alternative targets that allow greater nominal growth – even if it means temporarily busting current inflation targets. In a speech this week Stanley Fischer, Vice Chair of the Fed, insisted on the existence of the Phillips Curve. It made little sense. If, after more than 50 years since it’s invention the curve may be still be flat or horizontal then it would seem to non-economists that it is time to move on. He made many jokes and recalled many supposedly wise sayings, but one appeared to me to demonstrate why the profession of economics is held in such disrepute. But Paish also warned us that forecasting was difficult, and gave us the advice “Never look back at your forecasts–you may lose your nerve.” I pass that wisdom on to those of you who need it. It seems to typify economics as a profession, never let your theories be tested. Real scientists would say if your forecasts are consistently proven wrong then your models are wrong. The final comment in that Inflation and Unemployment section is what struck me as particularly disingenuous. How does the Fed demonstrate that they want to see the inflation rate increase? By actively tightening monetary policy in December 2015? By having so publicly forecast and fretted about a rise in inflation for months beforehand, thus passively tightening monetary policy? 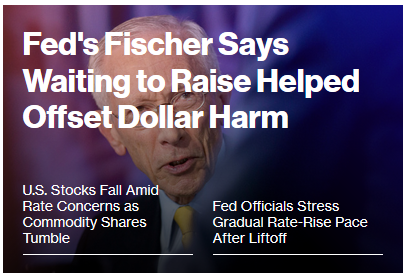 It appears that Fischer says he wants something but all his actions and his fretting tells the market that he doesn’t actually want it. Fischer’s Fed has consistently forecast a return to higher inflation as unemployment has fallen. It hasn’t happened, it will never happen if the Fed insists on tightening any time 2% is approached, either in real time or more importantly in the Fed’s own forecasts for inflation. His attitude to inflation was quite revealing when he was asked in the Q&A, about 42 minutes in, whether raising the inflation target to 4% was a good idea. He immediately responded by talking about other countries’ hyperinflation experiences. Great. Scare tactics. ‘If you touch the 2% target all hell would break loose.’ Really? Then he worried about too much indexation at higher rates of inflation and how hard it was to undo that indexation once embedded. A fair point, but not very relevant in a free market economy. Indexation is a supply side issue, and not really one for central bankers to address, though they may have to react to it once it is established. He then said that 2% is about right, “clearly here”, according to Greenspan’s definition of not having people having to think about the rate of inflation in their daily work. And “4% is the other side of the line”. Is there really such a difference? Was the average of 2.5% PCEPI throughout the Great Moderation so bad? And lastly he mentioned the “credibility problem of changing targets in mid-stream, because that’s easy”. It’s easy, perhaps because it’s right. Empirical work done at the Fed and elsewhere suggests that QE worked in the sense that it reduced interest rates other than the federal funds rate, and particularly seems to have succeeded in driving down longer-term rates, which are the rates most relevant to spending decisions. The Fed has claimed that is the reason they did QE, to bring down longer-term rates, but they keep missing the Fisher effect. 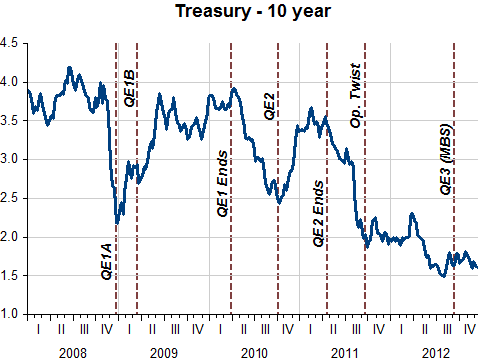 If QE is really working then it is raising longer term rates, reflating the economy. Fischer and the Fed have a truly massive blind spot here, one that makes their policy making hard to understand in the markets. At least Lael Brainard, on the same day, spoke more sense. Is there a generational debate at the Fed? The old guard of inflation hawks and those younger types more in touch with the lack of prosperity in the US. We hope so, although age shouldn’t be the main gauge for hawkishness. There are lots of older Market Monetarists too! Stanley Fischer has no idea about what tight monetary policy means! In early January, he thought four rate hikes in 2016 was in the “ballpark”. In a speech yesterday he was less sanguine, but still believes monetary policy remains accommodative. The framework under which the Fed operates, which Kocherlakota, who knows what he´s talking about, clearly set out recently, permeates the Fischer´s speech: “gradual” and “normalize”. “[M]y colleagues and I anticipate that economic conditions will evolve in a manner that will warrant only gradual increases in the federal funds rate, and that the federal funds rate is likely to remain, for some time, below the levels that we expect to prevail in the longer run” [the normal level]. The saddest thing is to see that to Fischer, as well as to many other FOMC members, what informs monetary policy is employment/unemployment and oil/commodity prices! 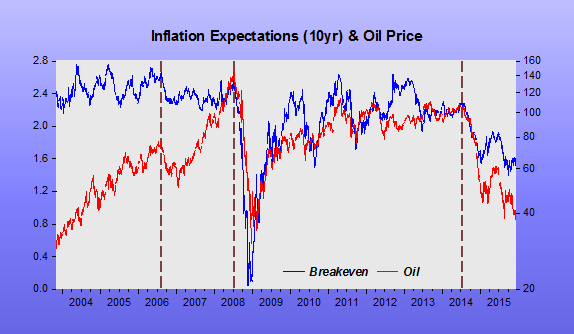 Within that framework, inflation will climb back to 2% when oil prices stabilize and unemployment falls a bit more! 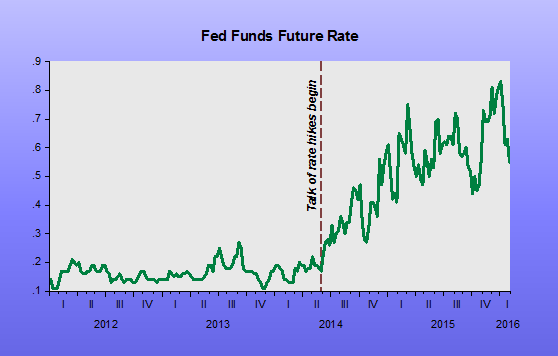 In a recent post, using the federal funds future rate, David Beckworth has argued that monetary policy has been tightening since mid-2014. That´s quite true as the chart indicates. More generally, that reflects the fact that NGDP growth, the best measure of the stance of monetary policy, has turned down since that time. This fall in AD growth has been accompanied by “negative” trends in most indicators of economic activity and sentiment, including oil prices and the broad dollar index. Only when a recession is announced by the NBER will the Fed realize it has been on a tightening spree! “Because of their significant concern about still-low readings on actual inflation and the uncertainty and risks present in the inflation outlook, (officials) agreed to indicate that the (Fed) would carefully monitor actual and expected progress toward its inflation goal,” the Fed said in minutes of its Dec. 15-16 policy meeting released Wednesday. But they hiked rates anyway! Fischer’s comments suggest that the central bank may need to rely more on monetary policy to restrain financial excesses than it has in the past. In fact, he told the conference that it might be necessary for the Fed to increase interest rates if financial markets were overheating, though the first line of defense should be the use of regulatory measures to head off bubbles. A rate hike was the “mutually satisfactory” outcome. Over the past few years, the Fed-cacophony has been loud. That has kept people devoting a lot of time and effort to extract some sort of signal amid all the noise. Enters the Wall Street Journal to provide some guidance about whom you should listen to help form your views. It says most member’s views are dispensable, so you should concentrate on listening to Yellen and Fischer, the Chairperson and Vice-Chair, and not waste much time following up on the others. It´s a pity that Yellen´s and Fischer´s views have been so pathetic! On the other hand, the views of someone like Bullard veer so much that they most resemble a windsock! Has Stan Fischer gone gaga? A strong dollar is restraining U.S. inflation and exports, justifying a slower pace of interest-rate increases, but on balance the U.S. economy is riding out the effects fairly well, Federal Reserve Vice Chairman Stanley Fischer said Thursday. He can´t see below the surface and misses the fact that the strengthening dollar (and low inflation) is a consequence of the tight policy his ‘bank’ has adopted! Or, it could be smart blame shifting, as in “In spite of that the ‘bank’ has done quite well”! 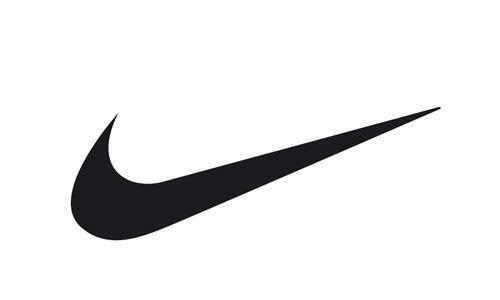 Monetary Policy according to the Nike Creed; “Just do it”! Emerging-market officials aren’t the only ones looking for the Fed to get on with it. Jens Weidmann, president of Germany’s central bank, said the prospect of emerging markets’ getting hurt by a Fed-induced capital outflow is “no reason” to delay a rate increase that is justified by data. A U.S. rate increase “would be a reaction to a better economy and that would ultimately be good news for the world economy,”(!) he added. 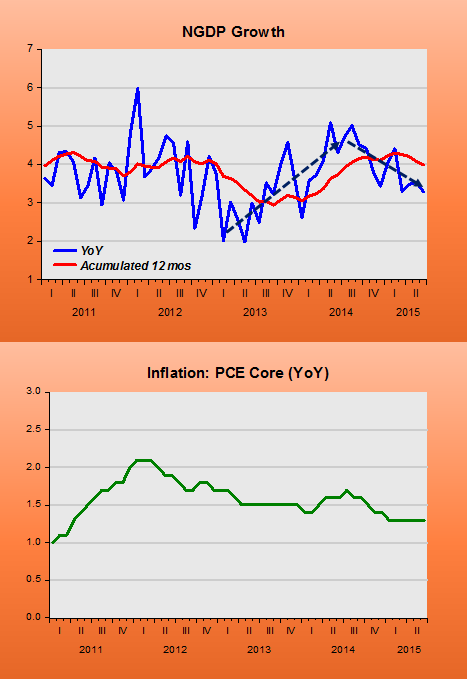 What could justify Stan Fischer´s ‘confidence’ that inflation will move up? It´s not only Stanley Fischer, but many others at the FOMC that express ‘confidence’ about inflation moving up to the 2% target (ceiling?). That would be a ‘miracle’ given the behavior of NGDP since January 2011. 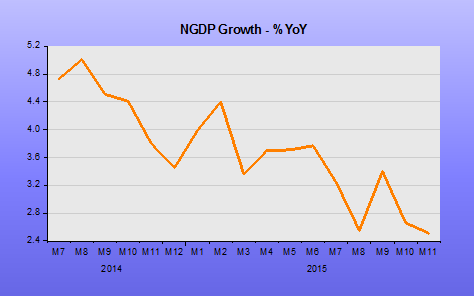 Both on a YoY basis and on the much smoother accumulated over 12 months basis, NGDP growth has averaged 3.8%, with a recent tendency to decline. It´s more likely that inflation will go lower, not higher. The rate hike “threat” that has been going on for more than one year has noticeably tightened monetary policy, and is reflected in the downtrend in NGDP growth. If they were smart they would loosen monetary policy even with rates remaining at “zero”. Instead of continuously threatening to raise rates, they could promise a higher level of NGDP! PS If the Fed continues “threatening” it will likely move up the date of the next recession! The Jackson Hole Score: Inflation, 1000. Aggregate Demand, 2. Fed Veep Stanley Fischer Mentions inflation 75 Times In Brief Presentation; Aggregate Demand, Once. When the Federal Open Market Committee was meeting in 2008, and the globe sinking into the worst recession since the Great Depression, there was nearly only one topic on FOMC attendees’ minds: Inflation. Transcripts released of 2008 FOMC meeting reveal the world “inflation” was mentioned 2,664 times in the year’s eight meetings. It was a monomania. But, in reading about the Fed and global central-banker confab in Jackson Hole, it is painfully obvious that little has changed since 2008. Forget that global trade in H1 2015 is down YOY, and that inflation is dead in the United States, really dead in Europe, and long dead in Japan. Forget that Q2 in Singapore was a deflationary contraction. Forget that nowhere on Earth is there an industry straining to meet demand. There is only one topic central bankers know, and that is inflation. The topic “football” is less-mentioned at Super Bowl parties. Fed Vice Chair Stanley Fischer’s presentation was, sadly, typical fare at the Jackson Hole group-think, bias-confirmation fest. Fischer gave a brief talk at Jackson Hole (well, “brief” by economists’ standards), and the word “inflation” was mentioned 75 times. The word “growth” appeared three times in the Fischer soliloquy. The phrase “aggregate demand” appeared…once. Investors—when central bankers determine your fate, think 2008. The outlook does not look good for stocks and property, though perhaps risk-free U.S. government bonds will do well enough. Deflation could be on the global horizon, plus recession. Invest accordingly. If you know how, send me a note.